“Do nothing in haste, look well to each step, and from the beginning think what may be the end." This time of year it gets dark early on the eastern side of Mt. Washington. The sun slides behind the walls of Tuckerman Ravine early in the afternoon. By 3:30 pm the entire cirque is in shadow, and it gets cold. It was just about this time last Saturday that Doug Millen broke his leg high on the mountain. 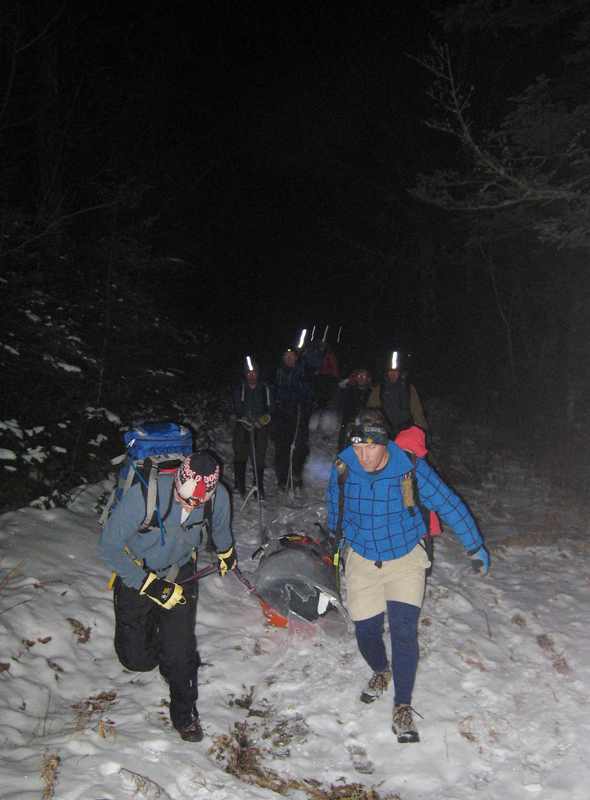 Doug was climbing alone, but another hiker saw his fall, and descended to Hermit Lake to get help. It was Dave Kelly’s first day on the job as the new Assistant Caretaker. He quickly loaded a rescue pack and radioed down to Pinkham. As it grew dark he climbed through the Ravine. The cold weather in late October brought a lot of snow to the higher summits, and the summer hiking trail through the Ravine was a technical snow slope. The 40-degree slope ended in sharp rocks sticking out of the snow like shark's teeth. A fall by any rescuer here would result in another patient. Up above, Doug had dragged himself a few hundred feet before the painkilling effects of adrenaline wore off. He stopped just above a tightrope traverse across a cliff and very steep gullies. Fortunately, he was well-prepared, with a sleeping bag, sleeping pad, and a thick belay jacket. He managed to put on a thick jacket, and hunkered down against the wind. He watched as Dave made steady progress through the Ravine, and disappeared into the cliffs below. Fifteen minutes later Dave radioed to say that he had reached his patient, and that a rescue would require rope work. While Dave improvised a splint for Doug’s leg, phones began ringing down in the valley. Stephanie Ritchie was on duty at the Pinkham Front Desk. 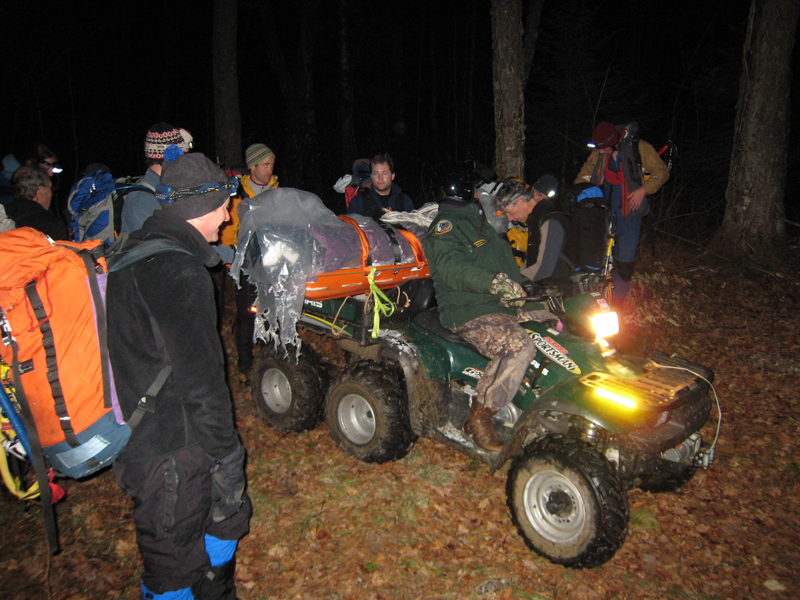 As soon as Dave radioed from the Ravine she phoned NH State Police dispatch. They in turn dispatched Lt. Doug Gralenski from NH Fish and Game. He in turn called members of the Mountain Rescue Service (MRS) in North Conway. Stephanie rounded up AMC volunteers at Pinkham and on the phone. Most of us were thinking about dinner when the phone rang. I had just hiked out from Zealand Hut. I had to dig deep into my closet to find my winter gear. 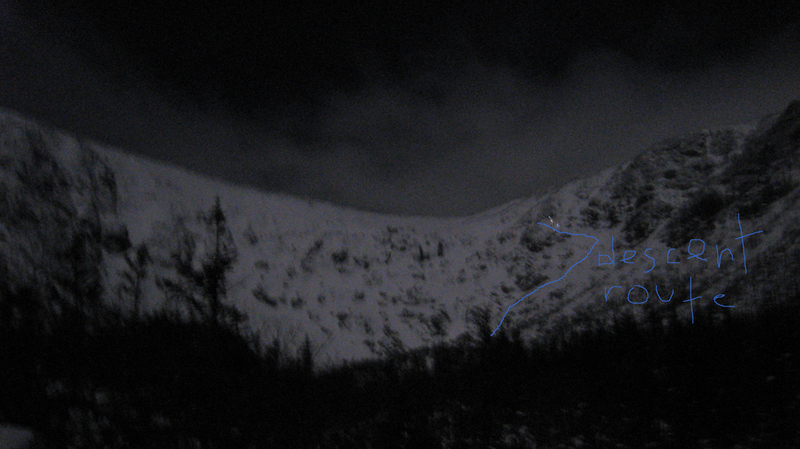 By 5:30 the Pinkham parking lot was busy with people stuffing gear into their packs in the blue glow of their headlamps. Eric Pedersen and I headed up the Tuck’s trail along with a few Fish and Game officers. The moon was very bright, and we could see Lion’s Head and Raymond Cataract looming through the bare branches. By 6:30 we were climbing the snow slope past Lunch Rocks. At Pinkham it was calm and in the mid-20’s. In the Ravine it was blustery and in the low teens. The wind chill was below zero. Chris Fithian, the Head Caretaker, had hiked back up from Pinkham and worked with Ben Schott of the AMC to drag a litter up to Doug and Dave. Tim Martell from MRS arrived soon afterward with rope and technical gear. He set an anchor and began planning the lower. Though the weather was cold, it was clear and bright with moonlight. From where the litter was anchored you could look over your crampon points to the floor of the Ravine, 300 feet below. 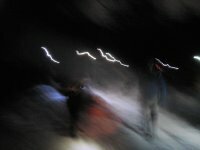 You could watch the headlamps of rescuers moving uphill in twos and threes through the dark boulders far below. Alain Comeau soon arrived with Travis Piper and a number of other MRS volunteers. Alain is an accomplished climber and guide. He is an expert on high-angle technical rescues, and teaches these techniques to guides, EMS professionals, and military special forces. The MRS members scamper around on steep ground as if it is level. 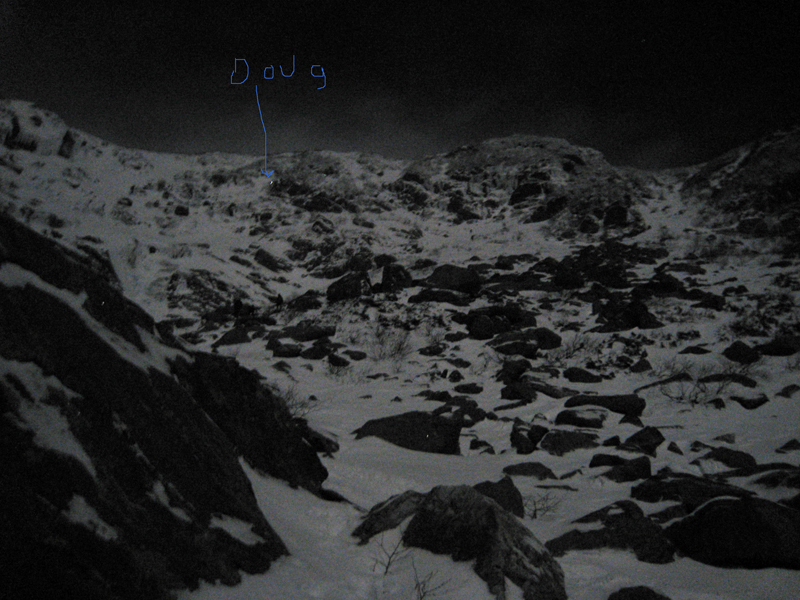 Within 30 minutes they set up a traverse line for the litter, and began moving Doug down the mountain. With several lives depending on their rope work, the MRS members have no room for error. Working in the dark they triple check their work, and back up each connection to the ropes. They must strike a balance between being extremely safe, but also moving quickly in the cold. Within an hour and half they had moved Doug off the dangerous terrain, and below treeline. We stopped briefly at Hermit Lake to warm the foot on Doug’s injured leg. Then it was back out into the cold to sled the litter down the Sherburne Trail. The snow here made the work a lot easier, and we all talked about what great skiing it would make. Taking turns pulling the litter on flats and rises, and restraining it on the downhills we made it down to the snowline. Only a few hundred yards from parking lot Lt. Gralenski met us with a Forest Service 6-wheel ATV. This carried Doug the final feet to the Pinkham pack-up room. As we carried him through the door I looked at my watch, it was 12:30am. Edward Whymper’s often-quoted warning to climbers can’t be quoted enough as winter arrives. The margin for error in the mountains is never great, and in the winter it closes almost completely. Doug took a chance by climbing alone, but he had considered “what might be the end” by bringing a sleeping bag and extra clothes. The end of his mis-step was a nine-hour night rescue and orthopedic surgery to insert a rod and pins. Over 30 people from 6 groups were involved in the rescue. Though Doug will not be able to climb Washington again this winter (he runs the NE Ice website – neice.com) he will recover to climb next winter. Given the fall on the Matterhorn that inspired Whymper’s warning, he was lucky.